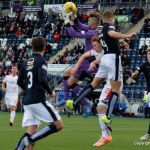 Raith Rovers conceded their first goal, and consequently suffered their first defeat of the season at The Falkirk Stadium today, as they lost 1-0 to Peter Houston’s side. 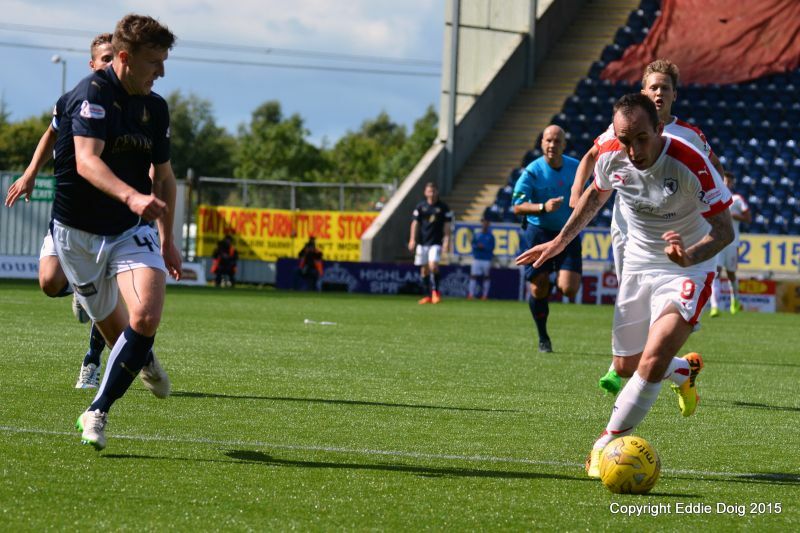 Rovers boss, Ray McKinnon made just one change from last weekend’s opening day victory over Livingston, with David Bates dropping to the bench, to be replaced by Kyle Benedictus, fresh from his suspension which caused him to miss the 3-0 victory. 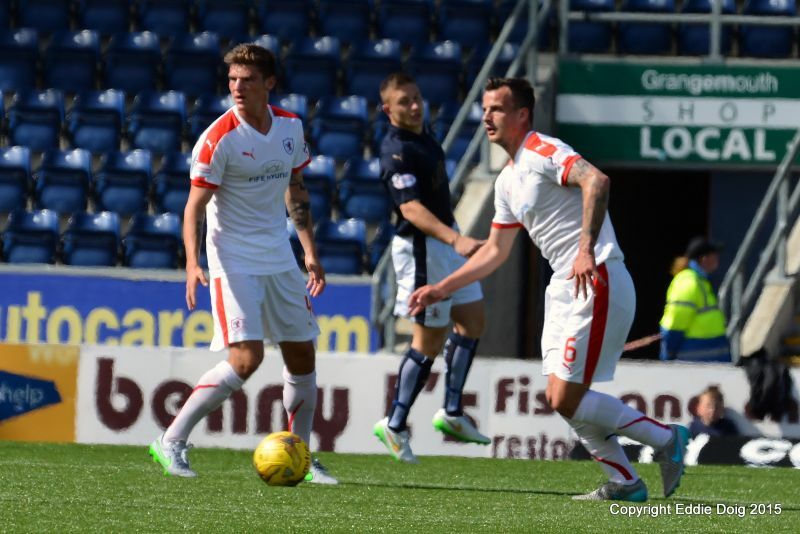 Falkirk featured three former Rovers in their starting XI. 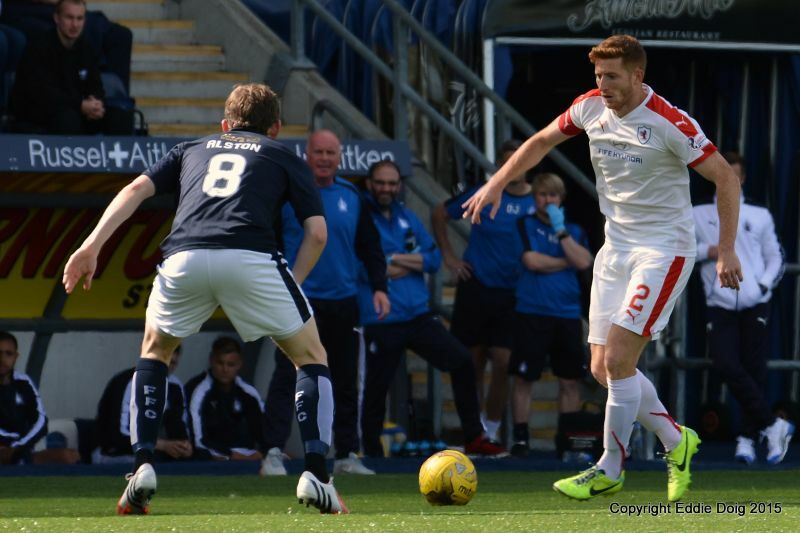 Paul Watson made an appearance in the heart of the defence, while David Smith operated on the right-hand side of midfield. 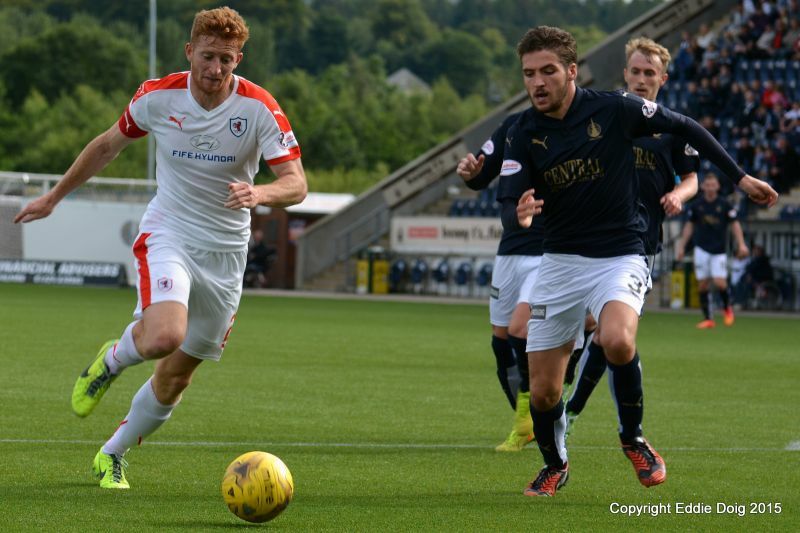 Last, and by no-means least, John Baird, so often the hammer of Raith last season, partnered Bob McHugh up-front. Unlike other matches around Scotland that were delayed due to traffic congestion, the fixture started bang on time, but at a fairly pedestrian pace. Indeed, perhaps the only point of note, was that there were very few noteworthy occurrences. 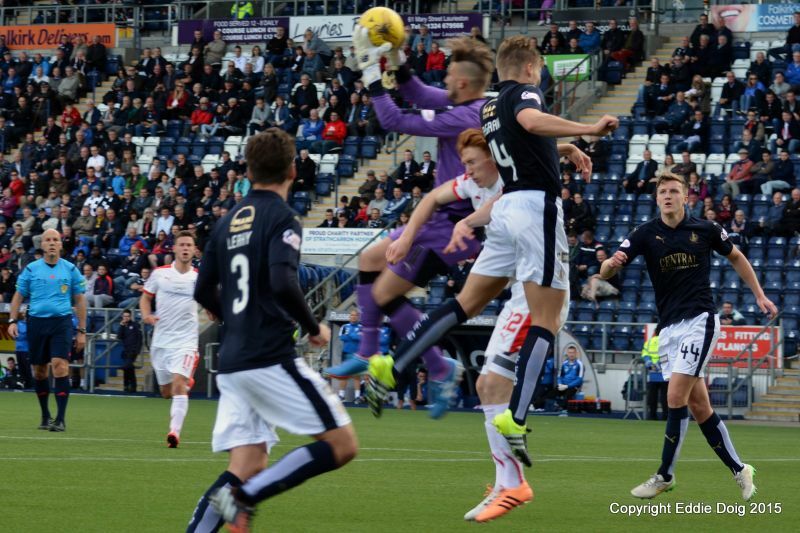 An up-and-under from Lewis Toshney called Falkirk goalkeeper Danny Rogers into action, who gathered well, while at the other end, the same Raith defender appeared initially to have misjudged the strength of his back pass, but with John Baird typically hovering to pounce, Kevin Cuthbert scurried from his net to clatter it clear. As the match progressed, it appeared the away side had arguably settled the better of the two, and created the first chance after 10 minutes. 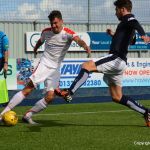 Jason Thomson did well to win a corner-kick down the right-hand side, and from Ryan McCord’s delivery, Kyle Benedictus rose above everyone, but his firm header was blocked on the line. 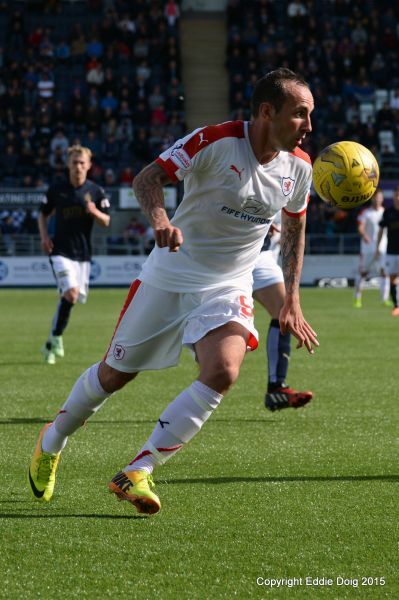 Other than that, Rovers failed to make much headway whilst in the ascendency, and slowly but surely, the home side started to creep back into the contest, with Mark Kerr especially in the middle of the park starting to control and prompt affairs. 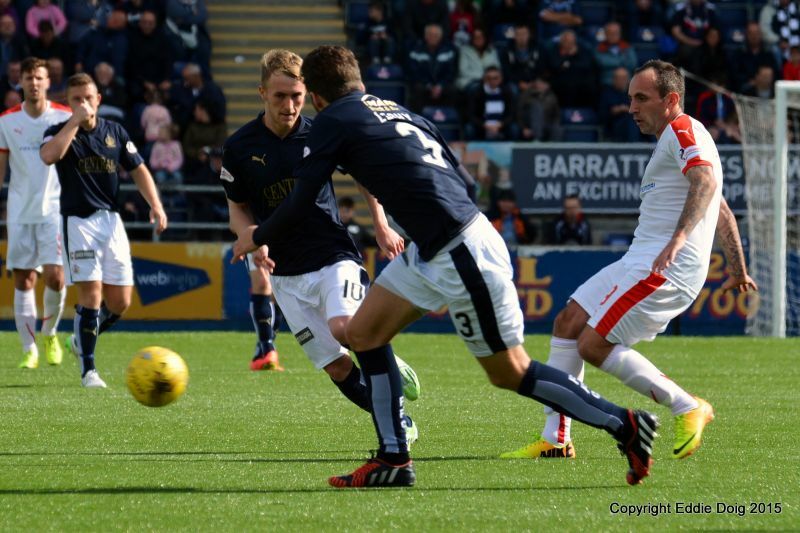 In the forward position for the Bairns, John Baird and Bob McHugh appear to have struck up an encouraging partnership, and the two combined to excellent effect, with Baird cleverly playing in McHugh inside the area, but his reverse pass to Blair Alston was cut out well by Benedictus. 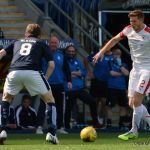 The flow of the match was now definitely more towards Cuthbert’s penalty area, although Raith were making it difficult for themselves, with forward passes from the back either easily cut-out, or wastefully inaccurate. They may have been toiling to create too much in open play, but Rovers did muster up a chance from a corner in the 23rd minute. McCord’s delivery was only half-punched clear by Rogers, straight to James Craigen, but his attempt to loft it over the crowd of bodies in front of him and into the net, only succeeded in lifting the ball over the bar. 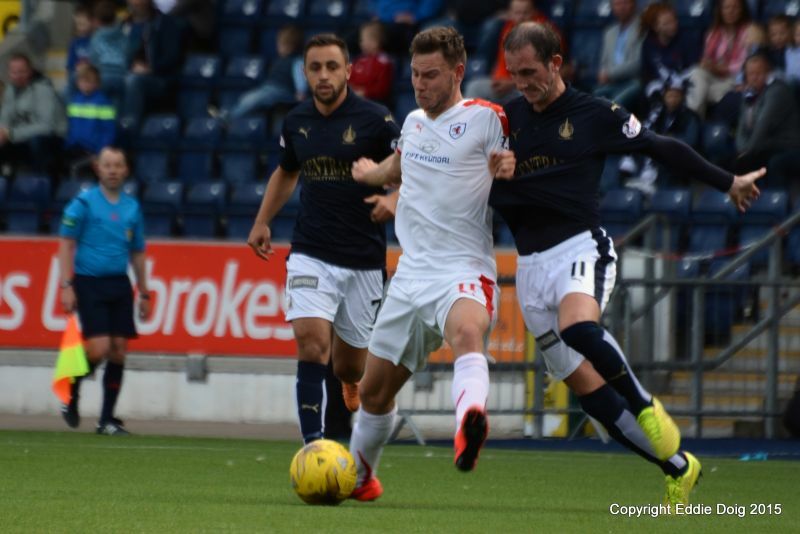 Falkirk then should have taken the lead, when they produced the best chance of the match up to that point. 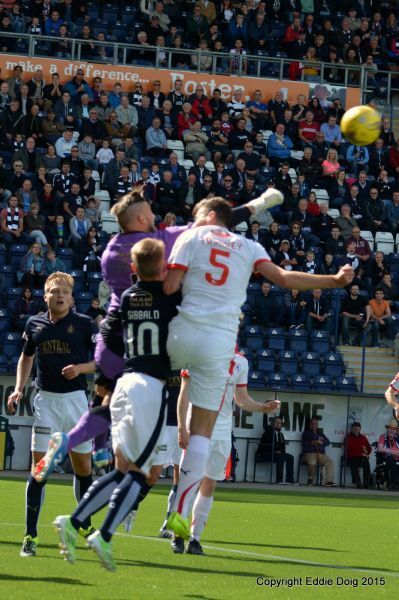 Excellent work on the right by the lively looking McHugh, ended up with Rory McKeown on his backside. McHugh’s dribble continued along the edge of the area, before he teed up the advancing Blair Alston, but his first-time effort went just past Cuthbert’s right-hand post. While the first-half had hardly been festooned with clear-cut chances, the second period started with a flurry of them. 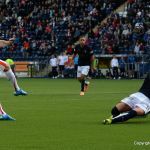 Firstly, a cross from David Smith found McHugh with space inside the area, and his glancing header would have ended up in the back of the net, but for an excellent stop from Cuthbert, who dived full-pelt to his right to scoop the ball to safety. Play went straight down the other end, and a few seconds later, the away side passed up their best opportunity. 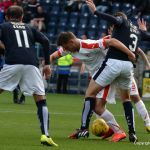 Wighton did well down the right, before looking up and picking out Stewart who had advanced through the centre and found himself an abundance of space. The pass inside was ideal, but with Rogers advancing, the forward failed to get a clean contact on his shot and the ‘keeper blocked with his legs. 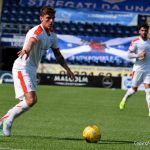 The second-half was looking a more even affair than the first, although ex-Raith loanee, Smith wasted a good chance, after cutting inside from the left, only to rattle a shot into the side netting with colleagues in support, much to their dismay. The chance-laden openness of the half had fallen away to be replaced by a tight affair, with neither goalkeeper being worked overly hard. 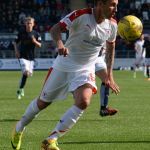 Rogers was again asked to deal with a cross ball in the 65th minute, and once more his punch lacked conviction, but Callachan’s attempt at a volley from 25-yards ended up as a throw-in to Falkirk, around 10-yards from the corner-flag. Both managers made an attempt to freshen things up, with Mitch Megginson replacing McCord, while Scott Shepherd replaced Smith. 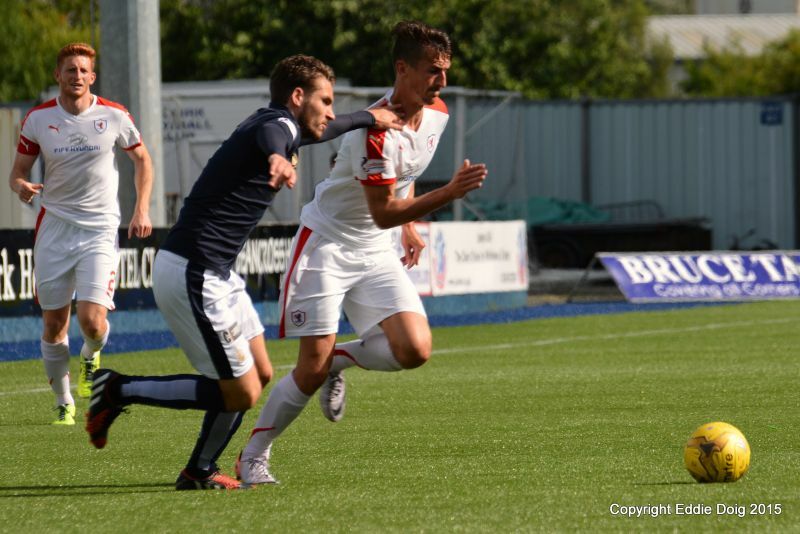 Megginson had taken Craigen’s position out wide with the latter taking a more central role. 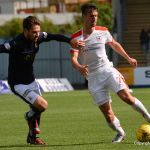 It was a positive move which may very well have paid dividends, but it didn’t get an opportunity to, as Raith were reduced to 10 men with 20 minutes remaining. 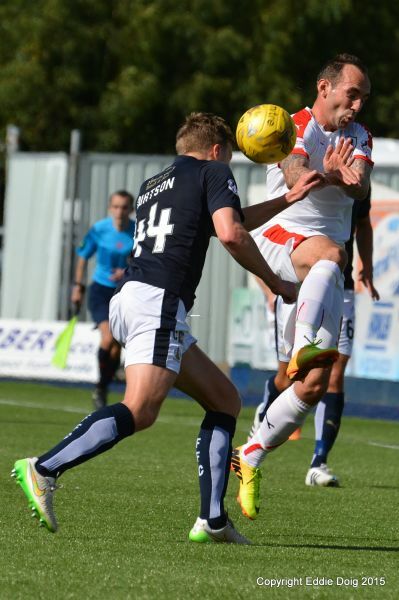 Baird and Benedictus both challenged for the ball, with the striker hitting the astroturf in the process. 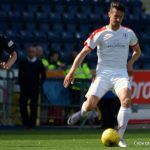 Benedictus had already been booked in the first-half, and referee, Stephen Finnie saw fit to admonish a second yellow, followed by a red. 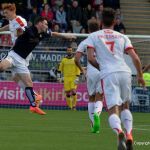 This immediately saw Wighton withdrawn for David Bates who plugged the gap in defence, leaving Stewart to plough a loan furrow up-top. 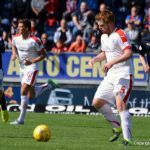 Despite the disadvantage, Rovers initially coped well, with only a shot from Sibbald and a wild swipe from Shepherd causing remote discomfort. 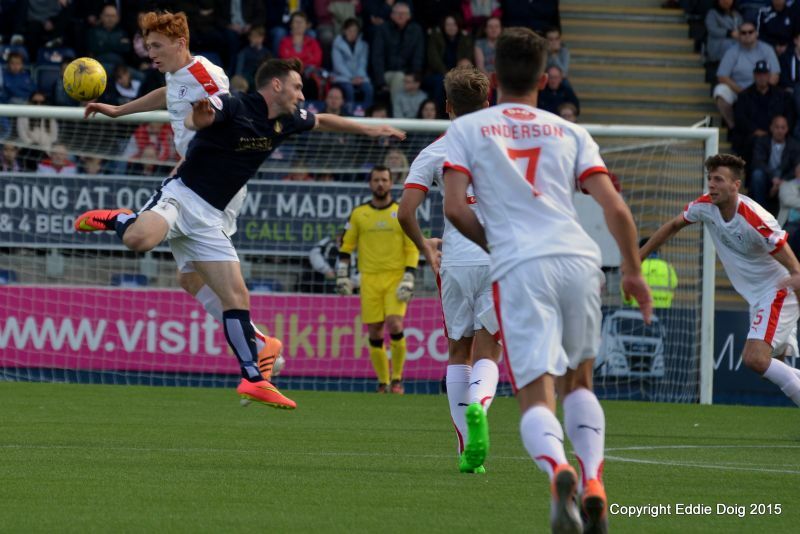 However, despite Falkirk not exactly battering down the door, they took the lead in the 80th minute. 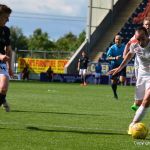 A simple ball was played inside to Kerr, and with no-one emerging from the pack on the edge of the box to press, the Falkirk pivot elected to have a blast from distance, dispatching his shot from 25-yards past Cuthbert and into the corner. 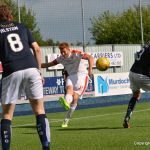 With five minutes remaining, McKinnon made his final change, replacing Grant Anderson with Iain Davidson, as he went with a 4-3-2 for the last few minutes, with Megginson asked to support Stewart. 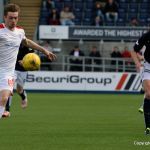 With the 90 minutes up, Rovers appeared to have spurned their last chance, after a long throw from McKeown was flicked on to Megginson, who did well to pick out Davidson, but despite being in plenty space, his shot was off-target. 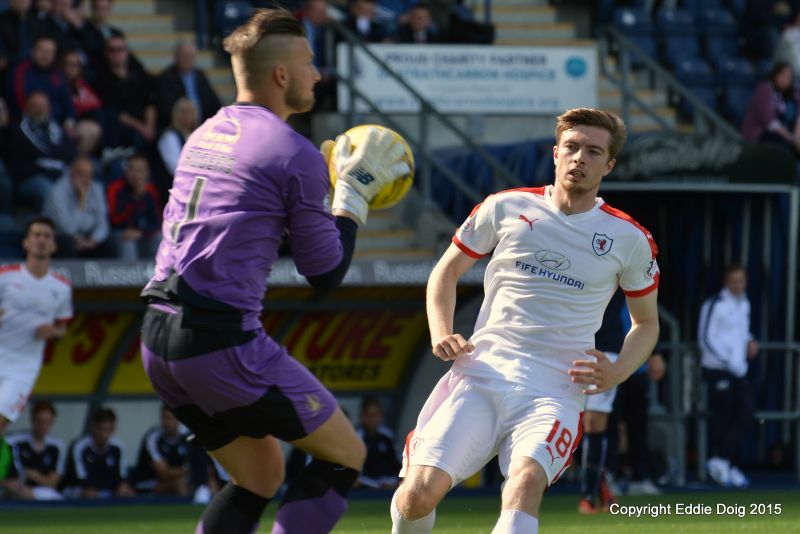 Incredibly, Rovers found time to create another chance, when great work from Thomson saw him cross from the byline, but while Megginson did well to gather and turn, his shot from the edge of the six-yard-box only found the side-netting. 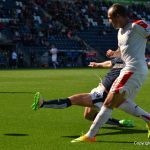 It was a frustrating end to a match that Rovers could very well argue they deserved something from. 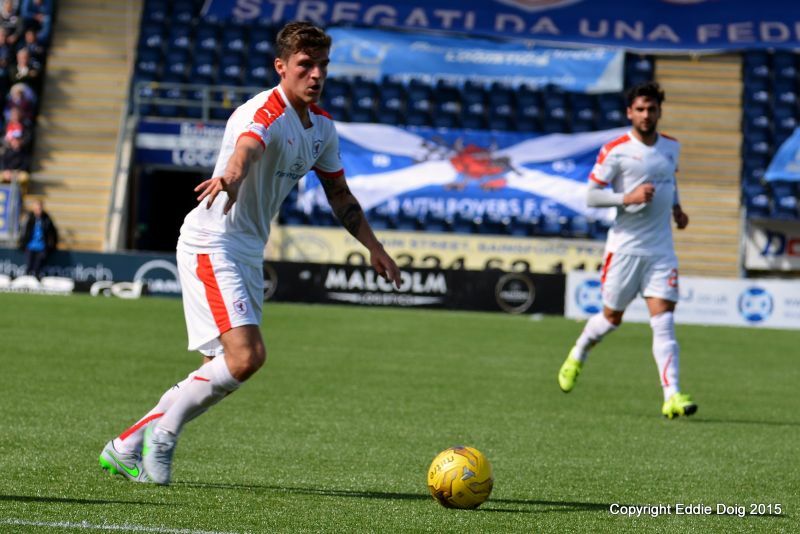 The players focus will now return to cup duty, when they travel to Stenhousemuir on Tuesday evening, for a Challenge Cup second round tie. Welcome to the Falkirk Stadium, it's 16 degrees, sunny with a slight breeze from the south. Three ex Rovers players in the home side while Mark Stewart will be familiar with his old stomping ground. 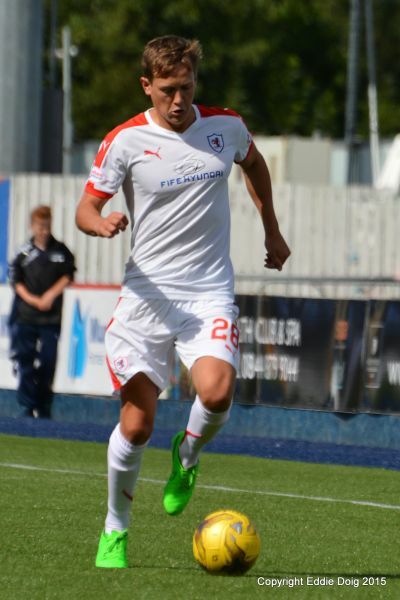 Rovers will be wearing the 'third' strip today, mainly white with red decoration, available only to order via the club, see the website for details. 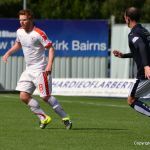 Baird kicks off towards the Rovers supporters. The two sides are just sizing one another up at the moment. 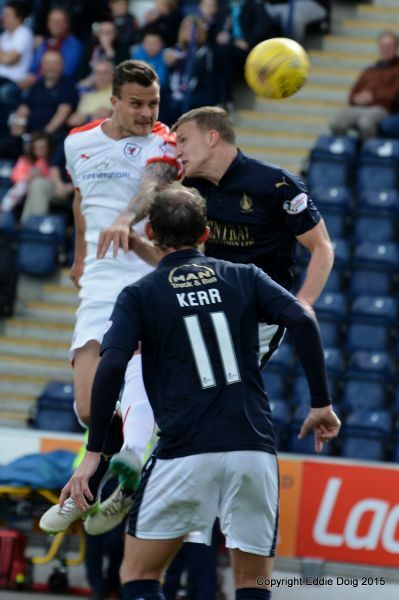 Stewart goes in for a header but Rogers has it covered. 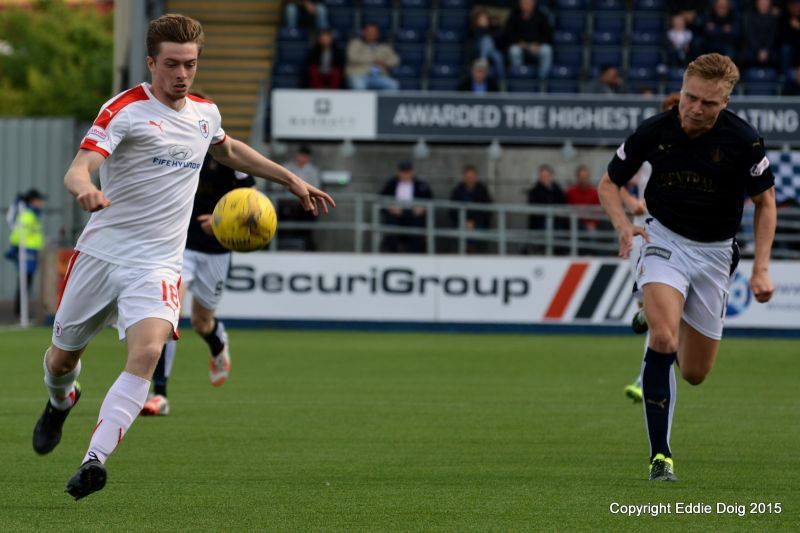 Callachan coming close with a header from the edge of the box. Baird and Smith combining but Benedictus cleared the threat. Baird having to change his shirt for some reason. Cuthbert commands his area, grabbing a high cross from the right. Baird down in the Rovers box with a head knock. Baird returns to the field. 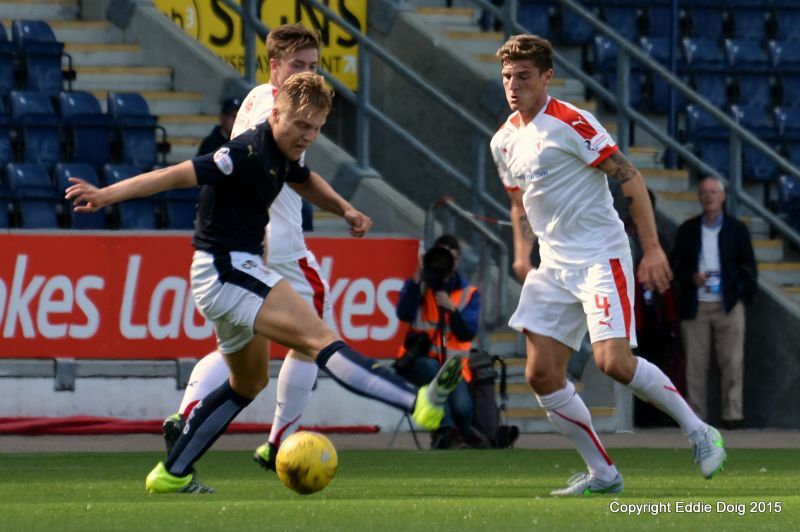 Falkirk just starting to edge the play. 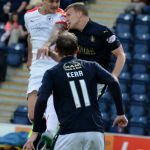 Rogers bundles Toshney to the ground as he comes out to punch a cross clear. McHugh out strips his marker on the right and crosses to Alston who shoots low, inches past the back post. Alston shows his frustration as Mr Finnie pulled back play for an infringement. Smith on his own, shooting into the side net from 18 yards. 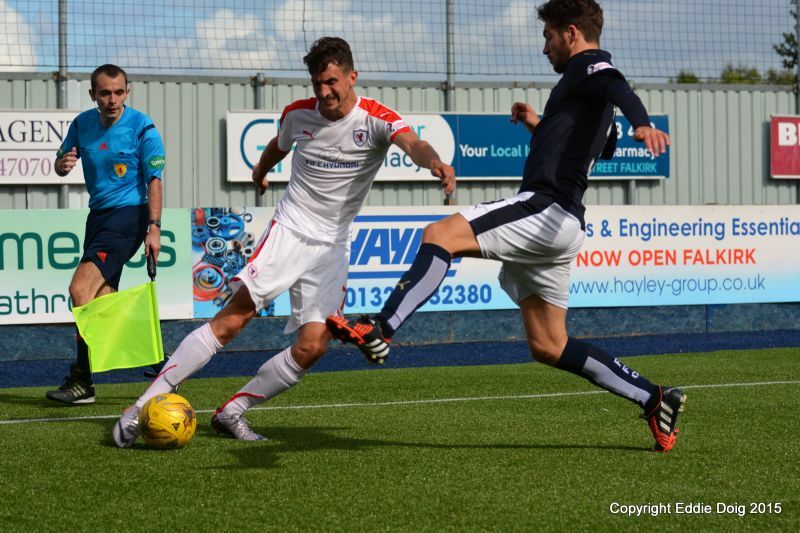 Baird through, 40 yards out thought he was heading for goal whe Thomson slid in to win the ball and clear. 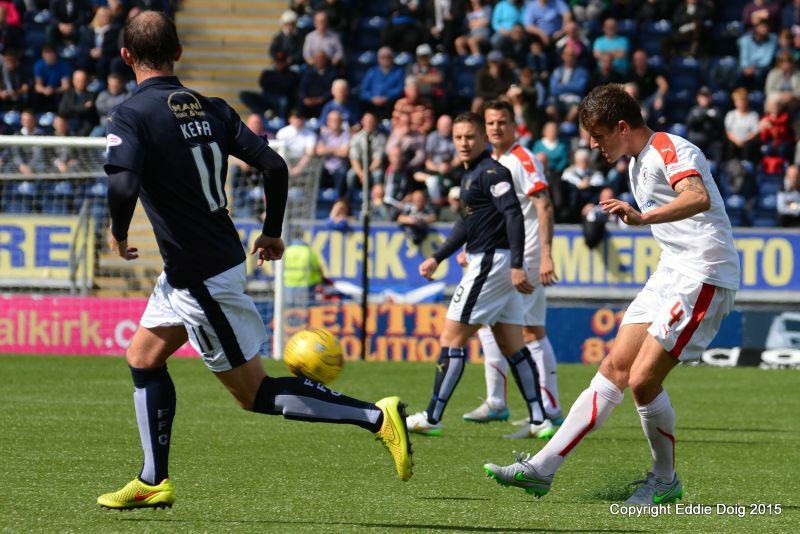 Stewart fires the ball across the face of goal from a narrow angle. Toshney looked to have hurt himself as he takes a wee breather. A wild clearance fell to Leahy on the left but his left foot shot spun off his boot and went into the crowd. Smith received a lecture from Mr Finnie for an outburst. 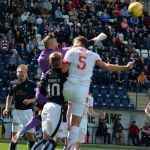 McHugh brings out an acrobatic save from Cuthbert who palms the ball to safety, a truly magnificent effort from the Rovers stopper. 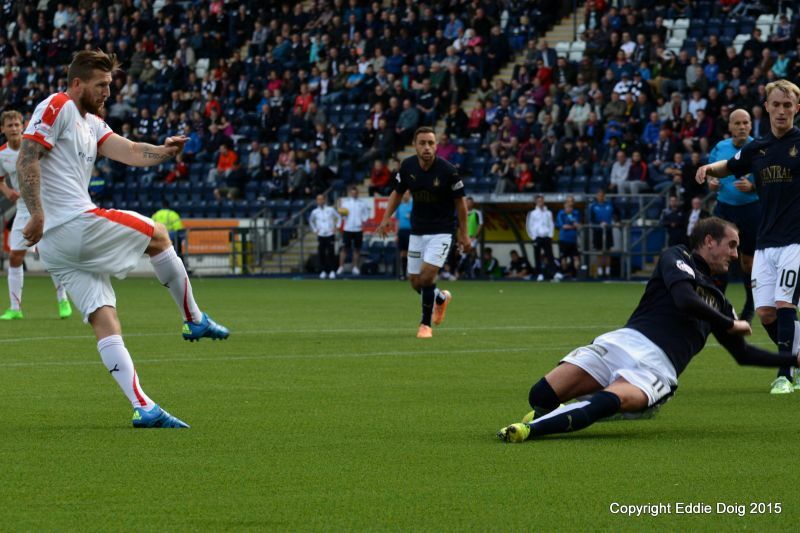 Stewart is man on with the keeper but Rogers saves with his legs. Cuthbert oozing with confidence as he pluckes another ball from midair. 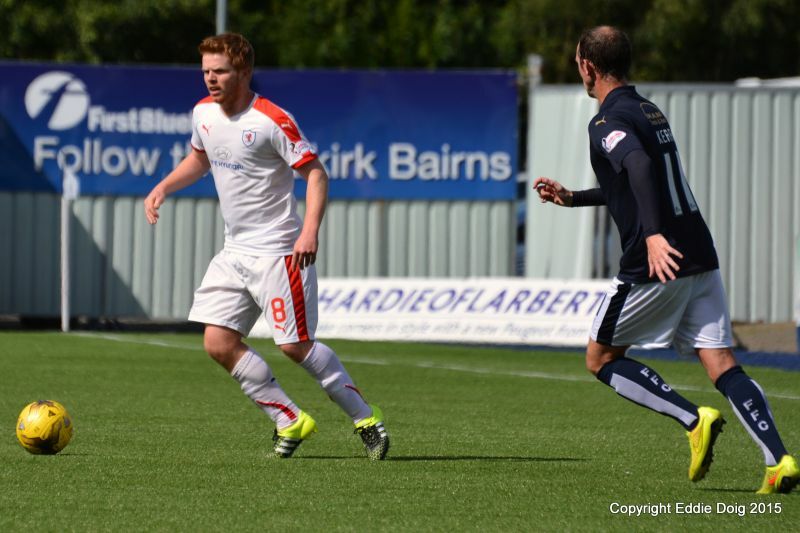 Toshney frustrating Baird who just can't get past him. 449 travelling Rovers supporters in a crowd of 3753. Rovers pushing up the park. Smith hits the side net but looks for a corner which is not forthcoming. 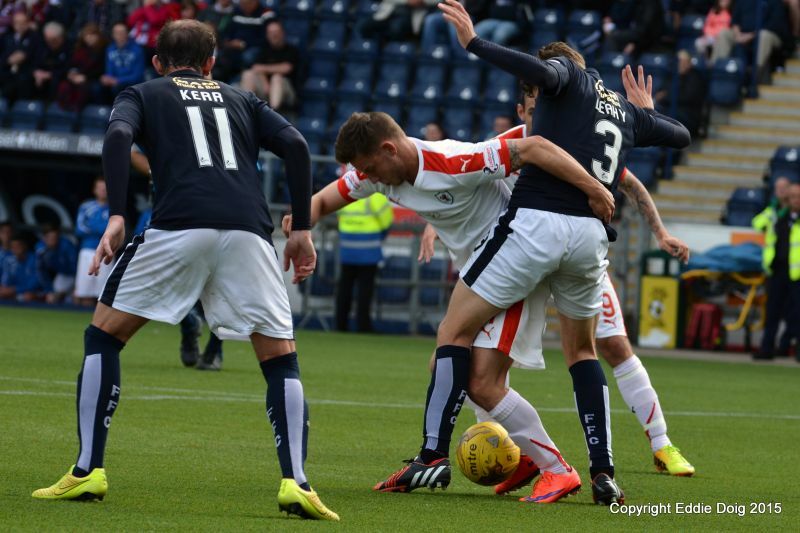 Stewart and Wighton press but Vaulks cuts out the final ball. Shepherd heads the ball into McHugh but again Cuthbert takes charge of the situation. Benedictus second yellow, sent off. Apologies for missing the first half booking of Benedictus. Cuthbert flying to his right to parry a cross from Vaulks. 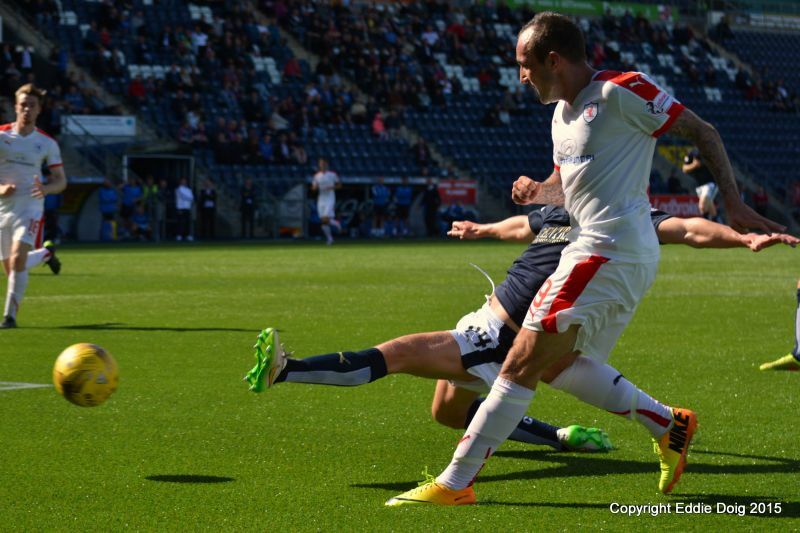 Rogers hurts himself coming for a cross from Callachan. Kerr in the clear curls a shot from 22 yards in at Cuthbert's right post. Great block by Bates getting in the way of a Baird rocket. 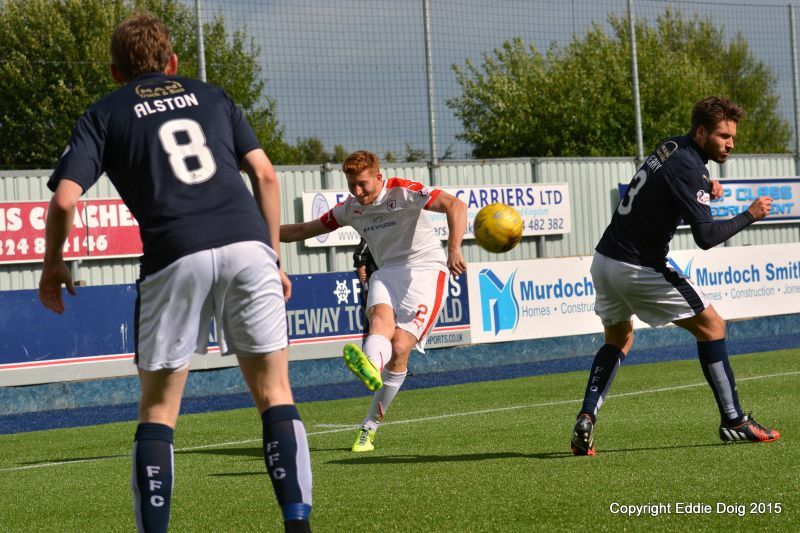 McHugh fires over the bar with a shot from outside the area. +1 Davidson sees his shot from 6 yards go past the back post, then Megginson hits the side net at the near post. Rogers, Leahy, Vaulks, Alston, Baird, Sibbald, Kerr, Grant, Smith, McHugh, Watson. Subs: Bowman (GK), McCracken, Taiwo, Cooper, Blair, Shepherd, Sinnamon. 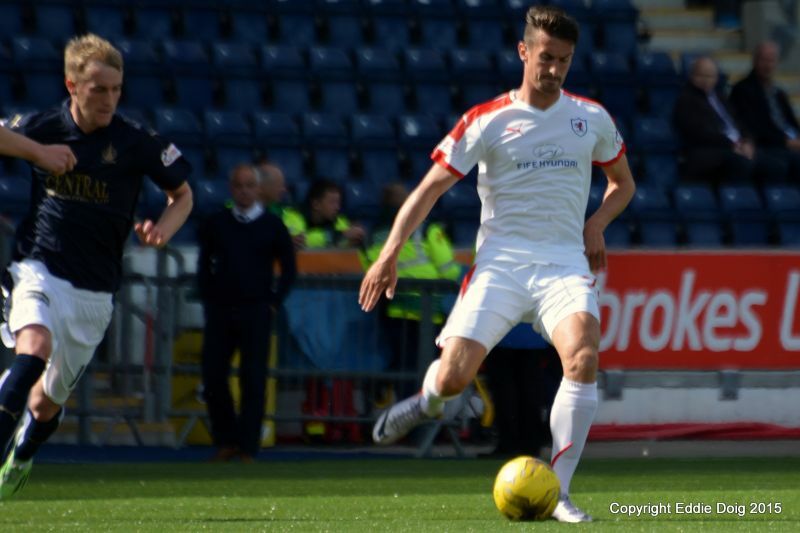 Cuthbert, Thomson, Callachan, Toshney, Benedictus, Anderson, McCord, Stewart, Wighton, McKeown, Craigen. Subs: Laidlaw, Petrie, Megginson, Matthews, Davidson, Bates, Ford. 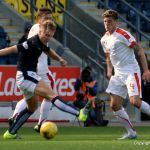 Raith Rovers will look to continue their unblemished start to the season this Saturday, when they head to the Falkirk Stadium, for what will be the the 150th league meeting between the two sides. 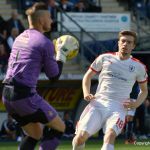 Rovers 3-0 opening day Championship victory over Livingston was their third consecutive clean-sheet of the season, while Falkirk’s campaign began with a 1-1 draw at Cappielow, with ex-Raith centre-half, Paul Watson grabbing Falkirk’s goal after 19 minutes. 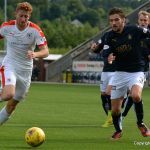 Unlike the majority of the clubs in the division, the Falkirk squad remained relatively stable in terms of comings-and-goings over the summer. 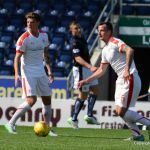 Peter Houston did have to contend with the blow of losing Rory Loy to Dundee, and Jamie MacDonald to Kilmarnock, but they’ve been replaced with ex-Motherwell forward, Bob McHugh, whilst in goals, Danny Rogers has joined on loan from Aberdeen, after a loan spell at Dumbarton last season. 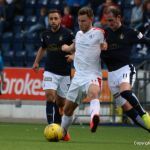 Falkirk also bolstered their defensive options, with the acquisition of Watson, after he left Stark’s Park after spending two seasons at the Kirkcaldy club. Last season’s results were evenly split between the two sides, with a couple of draws and a win apiece. 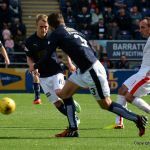 The first meeting was a fairly forgettable 0-0 draw at Stark’s Park in September, but a Ryan Conroy goal gave Rovers a 1-0 win at Falkirk at the tail-end of 2014. 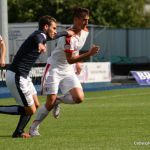 The second match at Stark’s Park again finished all-square, although it took a Will Vaulks own-goal and a last minute effort by Ross Callachan to swing a point in Raith’s direction. 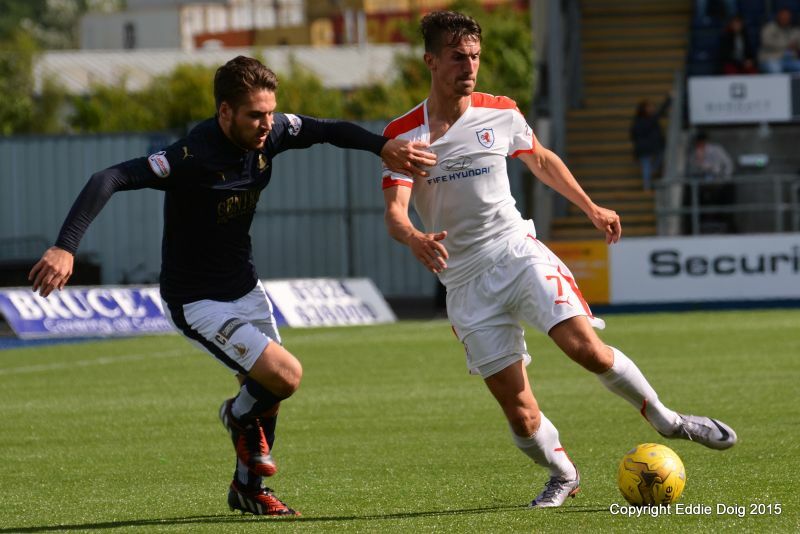 However, Vaulks would make amends in the fourth and final match-up, when his solitary strike was enough to hand The Bairns all three points, after Rovers had been reduced to 10 men due to Liam Fox’s dismissal. 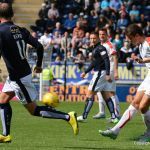 Raith have only won two of the last 10 meetings in all competitions between the clubs, with the other victory coming in the quarter-finals of the Challenge Cup in September 2013. 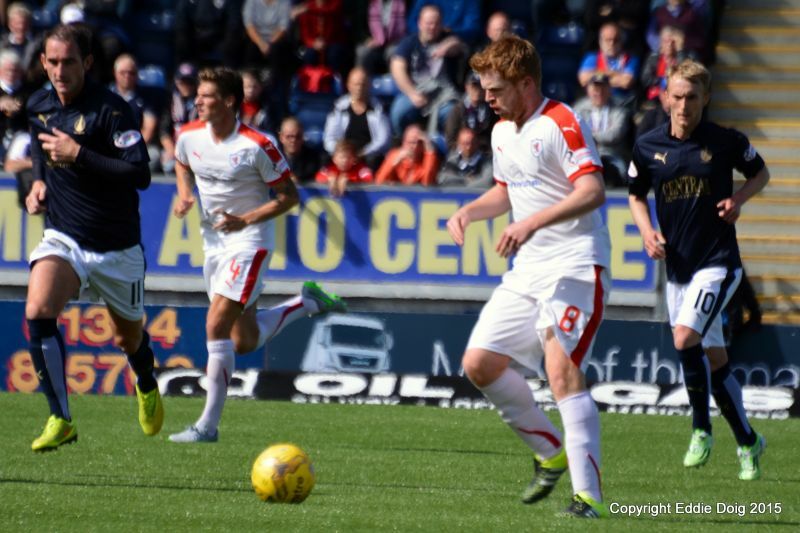 Greig Spence’s late goal was enough to see Raith through to the last-four. Saturday’s match referee will be Stephen Finnie.